I have LOVED the past few weeks. I have gotten some unique orders which always make designing a bit more fun. So far I have been working on a moving announcement that involves a road trip from one state to the next, a birthday party invite that include a little girl painting a pig, and a winery luncheon that involves turning wine glass stains into an actual wine glass. These clients have really kept me on my toes. 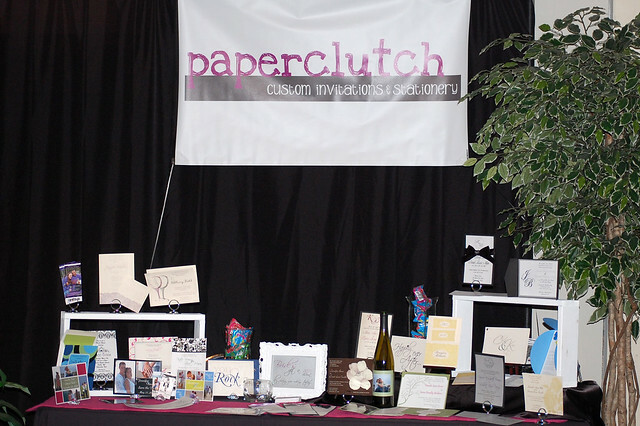 Not only I have been designing like a mad woman but I participated in my very first Bridal Show. Check out my booth- sorry for the terrible picture- I could not get the lighting right with the angle of my booth and my crazy extreme zoom lens. The ladies at Left Lane Productions did an awesome job putting this event on. 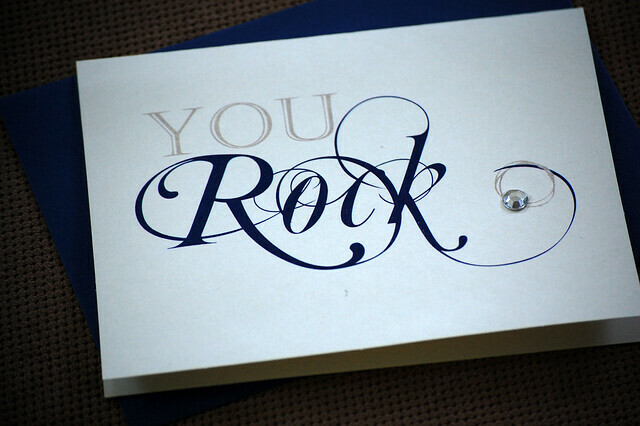 FYI: To all you brides who attended the event you will receive a 10% discount off your order. 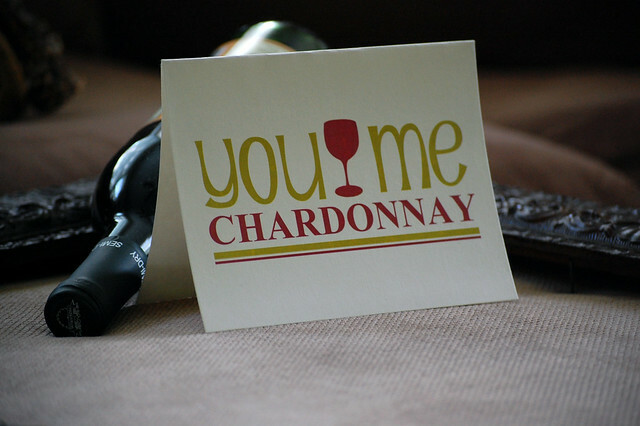 Check out the You Rock and You + Me Chardonnay Cards in my Etsy Shop. These are two new greeting card designs I recently created. Wow- I have been super busy lately. I wanted to fill you all in on a couple of invitations I have completed. Unfortunately I have been so busy, picture taking is on the back burner, therefore, I have not taken any good shots of my printed invitations so you will just have to settle for a digital version. I have a few more in the works but my rule is that I do not post any invitation or announcement until my client has put them in the mail. First I want to introduce you to my FABULOUS ticket stub design. I was so excited by these invitations! I have always wanted to do a ticket stub invite and I finally got my chance. Nicole and Wil LOVE the Vikings - they are actually from MN so they have every right to be. Me along with a few of my work buddy's are throwing Nicole and Wil a couples shower next weekend and we decided on a tailgating theme - corn hole and all and thought that a ticket invite would set the mood for the party. 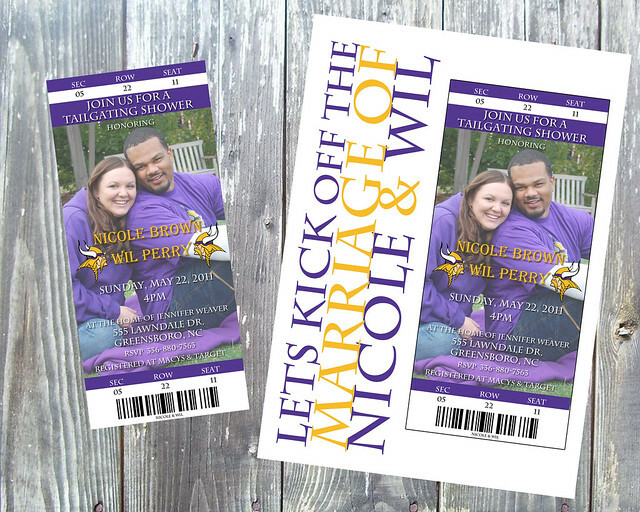 This invite was super easy since for Nicole and Wil's engagement photo shoot they requested pictures in their Vikings gear. I will have to post pictures of the actual party- I am in charge of decorations- another one of my favorite things. The next invitation is for a confirmation. This is the first confirmation invitation I have done. I think it turned out nicely. 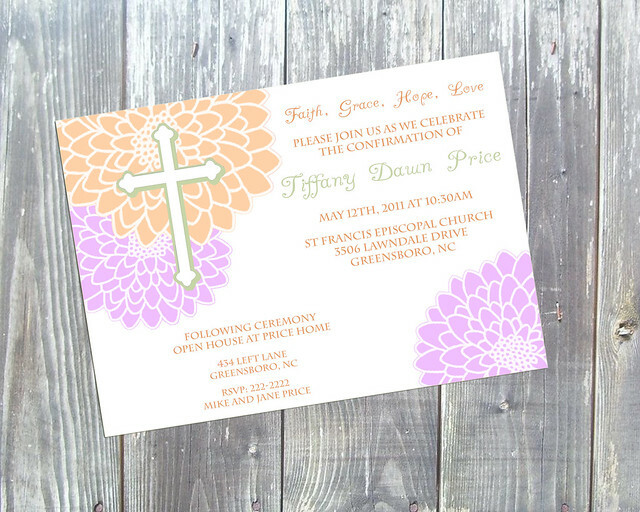 The color request was for a peach and green invitation but we decided to add some purple for more color. This weekend I am participating in my FIRST bridal show. I am a little frantic getting everything ready but I have faith that everything will turn out smoothly. I think the hardest thing is figuring out just what to do with my table display. If you want more information about the bridal show click here.